The benefits of progressive digitisation of Cable Television (CATV) have percolated down to every stakeholder in the industry. Better viewer experience for the consumer and higher subscription-based revenues for the MSO – these are the fruits of digitisation resulting in superior quality, higher transmission speeds and virtually instant connectivity. As Television and Internet reach out to more homes across the country, contributing to the mission of creating a Digital India, the miles are getting smaller. Hathway has been one of the early proponents and adopters of digitisation, and one of its early beneficiaries. 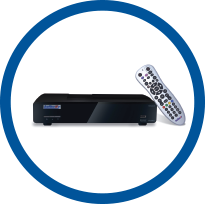 Our Standard Definition (SD) and High Definition (HD) high-quality Set-Top Boxes (STBs) offer superior video and audio quality. Manufactured by Skyworth, a renowned industry leader, these STBs are deployed with the industry’s most reputed and leading Conditional Access System (CAS) from CISCO (NDS). The system is integrated with our digital Head-ends that enable us to offer diverse services to a national audience. Apart from distribution of satellite channels, Hathway offers viewers and subscribers a unique bouquet of entertainment & infotainment channels with popular music and movies in both Hindi and regional languages. These channels include H-Tube, CCC Cine Channel, Hathway Music, Hathway Shoppe, Hathway Life in association with National Geographic, Hathway Entertainment and Hathway Movies. The advent of digitisation has opened up new vistas of customer satisfaction. The Company is gearing up to enable services such as Video on Demand (VoD) and interactive television services. Digital cable TV also allows operators to boost pricing power and grow ARPU (Average Revenue Per User). Bundled broadband boosts revenues and profits, and serves as competitive differentiation to DTH, while raising tax revenues for the Government. Digitisation is truly a win-win proposition for the entire industry. For the customers, it translates into a new level of engagement through a sophisticated subscriber management system. We have put in place OBRM (Oracle Billing and Revenue Management) infrastructure to deliver a 360°customer experience through our state-of-the-art call centres. Our call centre partners are leaders in the space, who deliver a customer experience like no other provider, while ensuring early and satisfactory resolution of grievances and concerns. Apart from CATV, Hathway offers true hi-speed broadband internet connections to homes and offices. Our dedicated Fibre Optic connections come with a variety of plans that suit different requirements and budgets. Our true hi-speed broadband offering, with up to 50 MBPS connectivity, is connecting the last mile across an expanding customer base across the country. As the first cable operator in India to offer broadband services and also the pioneer in offering HD services, we have the early-mover advantage that makes us one of the fastest-growing companies in the field. Hathway has taken services for its broadband customers to a new high with the launch of ‘Broadband Movies’ streaming service. The service is a collaborative venture between Hathway and Eros Now (the dedicated online entertainment service of Eros International). The subscription-based streaming service enables Hathway Broadband customers to watch high quality movies from the Eros Now platform on multiple devices like smart TVs, PCs, laptops, tablets and mobiles.